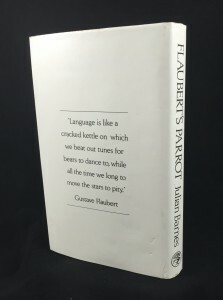 Notes on this Edition: Published by Jonathan Cape in 1984, Barnes’s third literary novel Flaubert’s Parrot was shortlisted for the Booker Prize and won the Geoffrey Faber Memorial Prize. 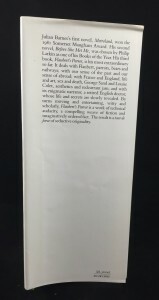 After being nominated for the Booker Prize, some copies of the first edition were issued with a red wrap-around band announcing the nomination. Several errant dust jackets were produced that were slightly darker in tone. Some of these jackets were distributed with review copies, but the rest were pulped in favor of the corrected jacket. The darker toned jacket is featured below next to the corrected jacket to emphasize the tone differences. 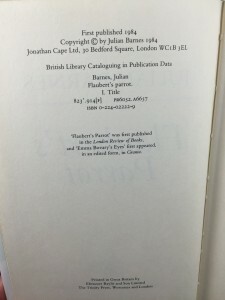 Descriptive Bibliography: First edition – London: Jonathan Cape, 1984. £8.50. Print run: 3000. Collation: 21.5 x 13.7 cm. Pp. [1-10] 11-190 [191-192]. 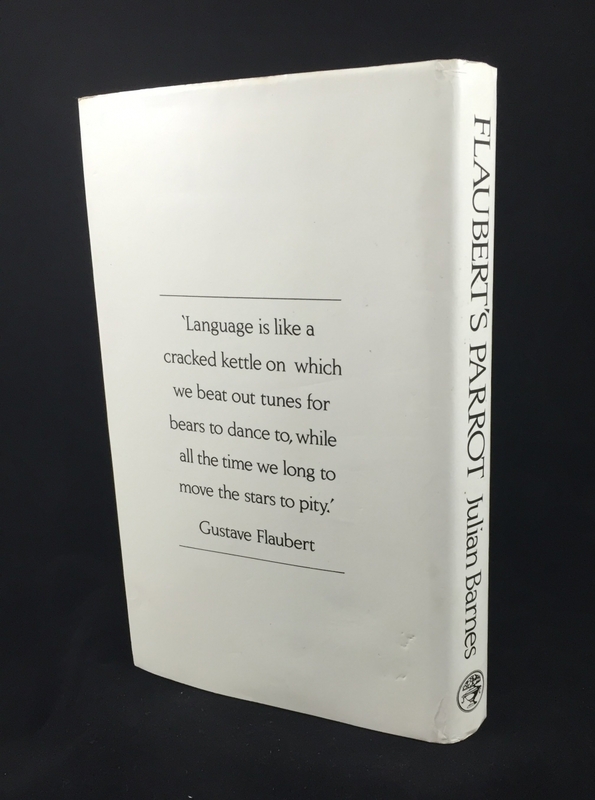 : ‘Flaubert’s | Parrot’. 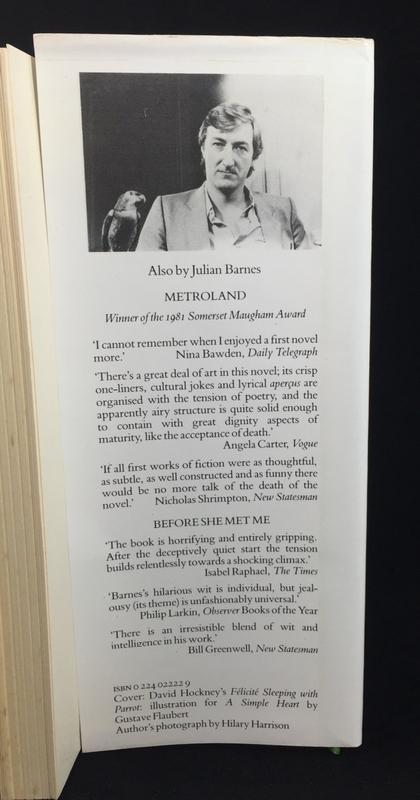 : ‘by the same author | METROLAND | BEFORE SHE MET ME’. : title page. 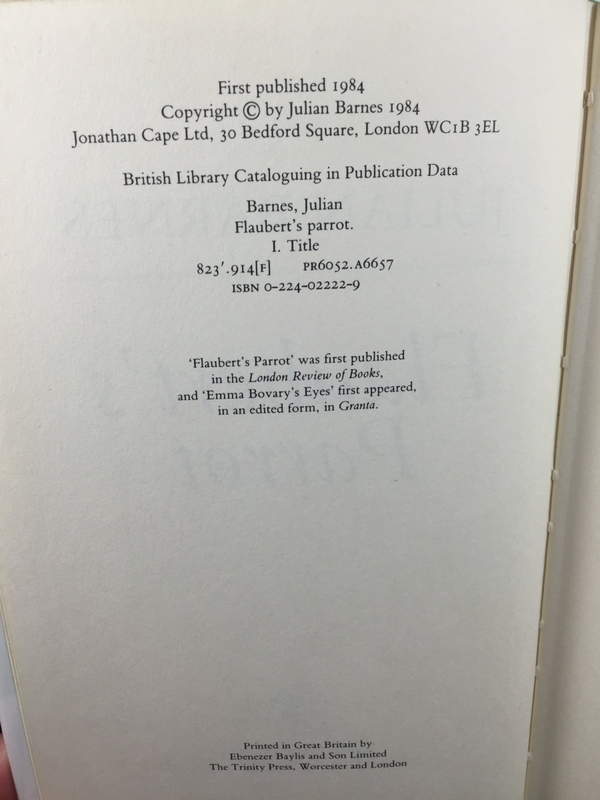 : copyright page. : ‘To Pat’. : blank. : epigraph. 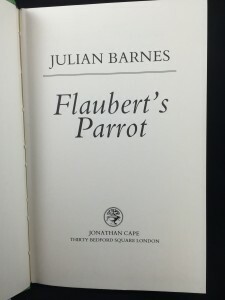 : ‘Note | I am grateful to James Fenton and the Salamander Press for per- | mission to reprint the lines from ‘A German Requiem’ on page 115. | The translations in this book are by Geoffrey Braithwaite; though he | would have been lost without the impeccable example of Francis | Steegmuller. | J.B.’. : [contents]. : blank. 11-190: text. [191-192]: blank. General description: Binding 22.2 x 14.5 cm. 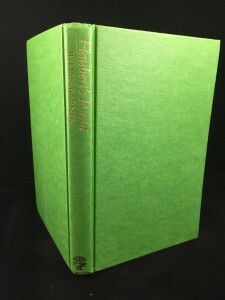 Green cloth boards, gold blocked on spine. White endpapers. 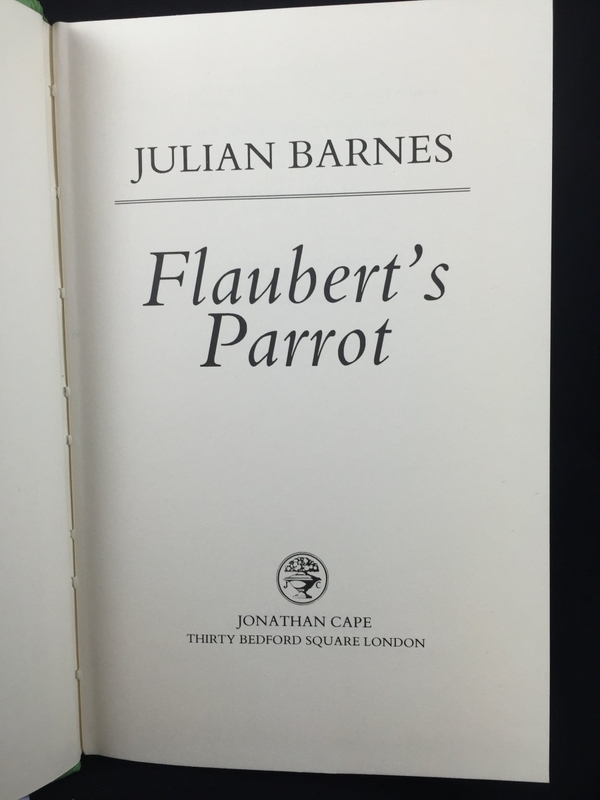 White dust jacket lettered in black. 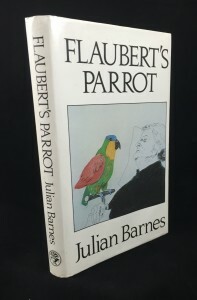 Cover image ‘Félicité Sleeping with Parrot’ by David Hockney. Photograph of the author on back flap. 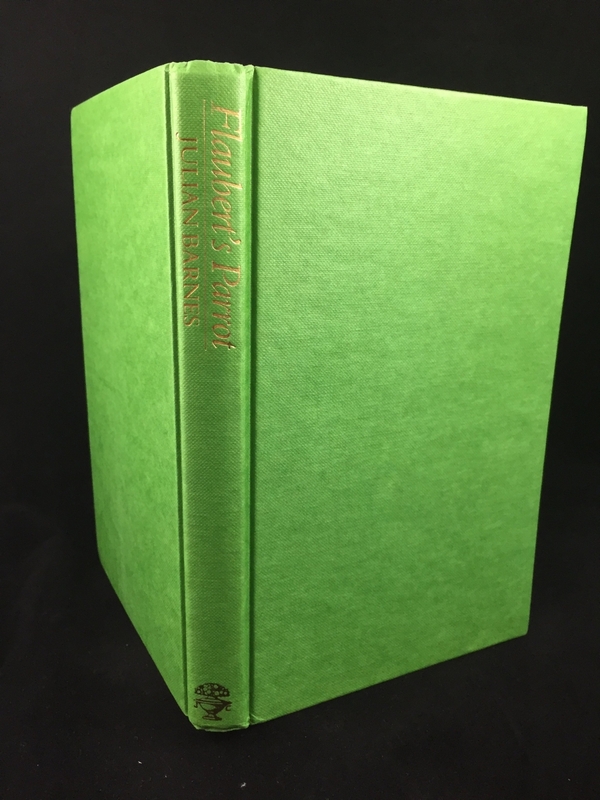 A small number of copies were issued in a first-state dust jacket with a misprinted color illustration.